I don’t know about you, but I have a mix of gadgets in my house. I have Alexa AND Google Home. And yes, I still expect everyone to play well together. I finally found a TV that is made to do that, it’s the all-new 2018 VIZIO P-Series® 4K HDR Smart TV. Every pixel is a masterpiece of color, clarity and contrast with the all-new 2018 VIZIO P-Series® 4K HDR Smart TV. With more than a billion colors, superior HDR performance and pin-sharp contrast in each frame, the P-Series also delivers serious smarts: VIZIO SmartCast™ makes discovering and streaming high-quality 4K HDR video incredibly easy. And support for Amazon Alexa and Google Assistant makes the P-Series a perfect smart-home centerpiece. he all-new VIZIO SmartCast™ offers unprecedented control and streaming options. Browse favorites like Netlifx and YouTube right on the TV. With Chromecast built-in, you can stream thousands of Chromecast-enabled apps from your phone to the TV. Support for Amazon Alexa and Google Assistant makes the P-Series a perfect smart-home centerpiece. 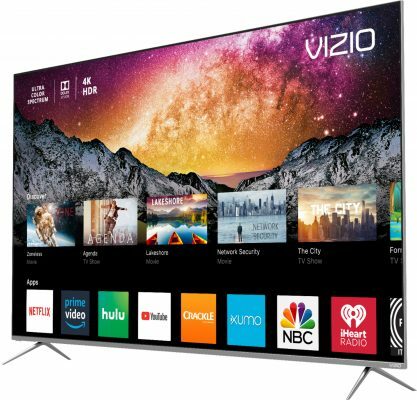 Offering a gorgeous edge-to-edge screen design, VIZIO’s P-Series 4K HDR Smart TVs will thrill the most-demanding videophiles.